Need professional towing services? Call us now at 850.588.1511! Autoworks Towing and Recovery is conveniently located in the heart of Destin. We offer 24 hour roadside assistance and tow services for Destin and the surrounding areas, and we tow everything from motorcycles to motor homes. Our Destin tow truck company has a professional team that can help you with all of your towing needs. We cover the local area with our fleet of modern equipment, including flatbeds, wheel lifts, service trucks and heavy duty wreckers. 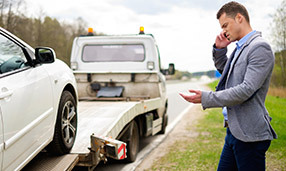 At Autoworks towing specializes in damage free towing, and we’re known for reliability. For all of your Destin tow service needs, AutoWorks Towing and Recovery is the tow company you need. We’re dependable, affordable, and we’ll provide you with a free estimate. With years of experience and an excellent service record, you’ll be glad you called us. Our uniformed professional technicians will provide fast, reliable and friendly towing. If it has wheels, we can tow it. We not only do towing for individuals, we do private property towing and can move illegally parked cars from parking lots. When you need any type of tow service in Destin and the surrounding area, send us an email or give us a call at 850.588.1511. We’ll be on the way. Welcome to Auto Works Towing! Welcome to Auto Works Towing of Destin. Please check back soon for specials or information on our services.